Saturn's Moon Iapetus - Universe Galaxies And Stars Section. Saturn's Moon Iapetus Has a Seam. Scientists already considered Saturn's Moon Iapetus unusual, because of its strange two-toned appearance; one hemisphere is dark, while the other is bright. But new images from Cassini show an even more unusual mystery: it has a seam. It's 20 km (12 miles) high and runs 1,300 km (808 miles) directly around Iapetus' equator. In some places, this ridge is so high it rivals Olympus Mons, which is unusual for an object which is 1/5th the mass of Mars. Researcher will have to wait until September 2007 for Cassini's next pass, when it will provide pictures 100x better resolution. Images returned by NASA's Cassini spacecraft cameras during a New Year's Eve flyby of Saturn's Moon Iapetus (eye-APP-eh-tuss) show startling surface features that are fueling heated scientific discussions about their origin. 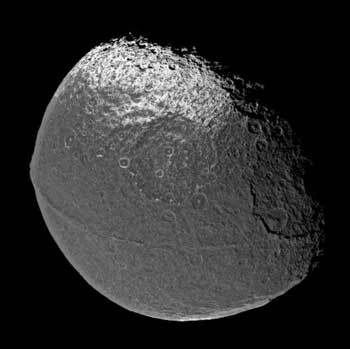 One of these features is a long narrow ridge that lies almost exactly on the equator of Iapetus, bisects its entire dark hemisphere and reaches 20 kilometers high (12 miles). It extends over 1,300 kilometers (808 miles) from side to side, along its midsection. No other Moon in the solar system has such a striking geological feature. In places, the ridge is comprised of mountains. In height, they rival Olympus Mons on Mars, approximately three times the height of Mt. Everest, which is surprising for such a small body as Iapetus. Mars is nearly five times the size of Iapetus. Images from the flyby are available at http://saturn.jpl.nasa.gov, http://www.nasa.gov/cassini and http://ciclops.org. Iapetus is a two-toned moon. The leading hemisphere is as dark as a freshly-tarred street, and the white, trailing hemisphere resembles freshly-fallen snow. The flyby images, which revealed a region of Iapetus never before seen, show feathery-looking black streaks at the boundary between dark and bright hemispheres that indicate dark material has fallen onto Iapetus. Opinions differ as to whether this dark material originated from within or outside Iapetus. The images also show craters near this boundary with bright walls facing towards the pole and dark walls facing towards the equator. Cassini's next close encounter with Iapetus will occur in September 2007. The resolution of images from that flyby should be 100 times better than the ones currently being analyzed. The hope is that the increased detail may shed light on Iapetus' amazing features and the question of whether it has been volcanically active in the past. The Cassini-Huygens mission is a cooperative project of NASA, the European Space Agency and the Italian Space Agency. The Jet Propulsion Laboratory, a division of the California Institute of Technology in Pasadena, manages the Cassini-Huygens mission for NASA's Science Mission Directorate, Washington, D.C. The Cassini orbiter and its two onboard cameras were designed, developed and assembled at JPL. The European Space Agency built and manages the development of the Huygens probe and is in charge of the probe operations. The Italian Space Agency provided the high-gain antenna, much of the radio system and elements of several of Cassini's science instruments. The imaging team is based at the Space Science Institute, Boulder, Colo.